Where did that tweet come from? If you are able to confirm that the tweet from a stranger in your Home timeline is not a retweet, continue reading. My username is zombiecharmer, and this non-RT tweet from a stranger just showed up in my timeline: http://twitter.com/joaovitorxavier/status/6472878712 ; As you can see, the person's name is joaovitorxavier. Thanks for looking into this! My username is cogitodexter - seeing random tweets in my timeline from people I've never heard of and which aren't retweets. One example from user "http://twitter.com/Anduaga" which is a protected user anyway: I'm not a follower and shouldn't be able to read their tweets at all. 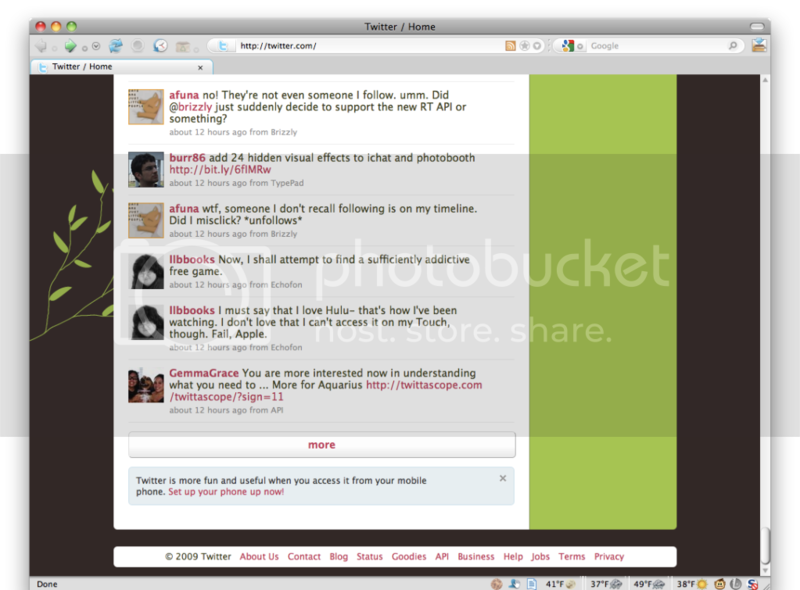 http://bit.ly/65dzRa is the screenshot of it in place. Hello. My username is may_kwok. There is a tweet from a stranger News_Germany, who I do not follow. Screenshot here: http://i528.photobucket.com/albums/dd322/chinafish81/other/stranger... The link in the reply (if that is what you mean the link to the tweet to the stranger is) http://twitter.com/?status=@News_Germany%20&in_reply_to_status_id=6... Thanks! I also just saw a protected tweet show up in my timeline from a total stranger. My user name: the_meghatron . Their username: chizu_barcinas. Link to the tweet: https://twitter.com/chizu_barcinas/status/6472977829. 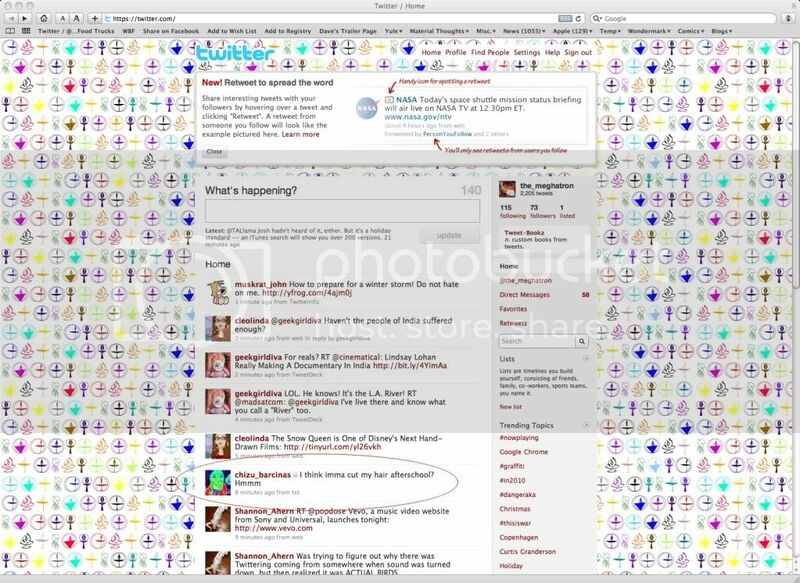 Here is the picture of the tweet, complete with lock icon, in my timeline: http://i326.photobucket.com/albums/k431/banfennid/twitter1.jpg and here is the picture of the user's profile page, showing that I should not be allowed to see their tweets: http://i326.photobucket.com/albums/k431/banfennid/twitter2.jpg . This is a serious security issue that needs to be resolved ASAP. username is roxpaul, the random person is TheTruEssence. http://twitter.com/TheTruEssence. It's definitely not a retweet, and I have no idea who this person is. Doubly weird because both her and my tweets are protected. Thanks for looking into it! my username is jackgraycnn and I just got a tweet on my home timeline from someone I don't follow. Username hollyinfrance, a tweet from user blackstar appeared in my timeline today. I contacted blackstar, who had appeared in other users timelines too (check tweets from/to my account to find the others involved if necessary), and they were not aware of the issue or why it had happened. Sorry this was some time ago, I can't find the exact tweet which appeared. Will try to do a screenshot if it happens again! Thanks for reading. 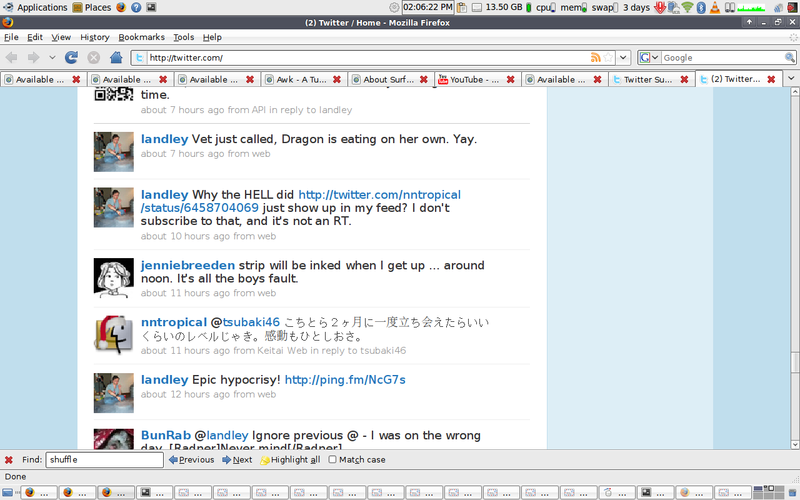 This person's twitter appeared in my feed: http://twitter.com/johnkunkle and I do not follow him. My username is kbear. This isn't the first incident, but didn't find the help forum on what to do until after I had blocked the user. handful of others, this is the latest. 1) My user name is Izandra. 2) The unknown user's name is Ashes_Within, and it is a protected user. 4) Sorry, am at work, can't do picture.